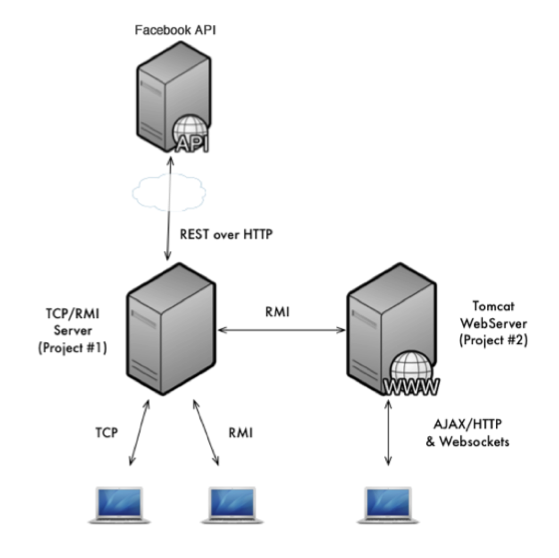 A social network application with integration with Facebook REST API and updates in real-time for users social activity, by making use of WebSockets. When a post is created, it’s created on Facebook. When a post is deleted, it’s deleted on Facebook. When a reply is made, it’s added on Facebook. The application uses 2 servers and 3 types of client: TCP, RMI (Remote Method Invocation, and HTTP. See the diagram below.